Alice is a 3D programming interface created by Carnegie Mellon University to promote women in technology. It is geared towards girls grades 6-9 and uses a combination of story-telling and basic programming to teach and encourage computing among young women. Using the Alice program it is easy for students to create animated movies and simple video games. 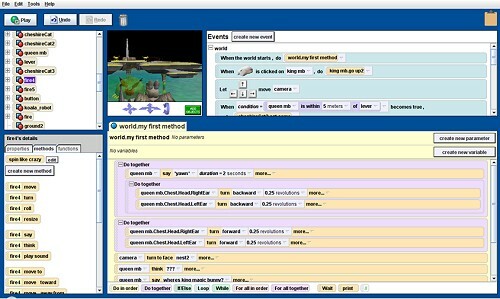 The interface allows the students to see the programming concepts behind their virtual worlds so they understand how those concepts affect the behavior of the objects in their virtual world. The programming instructions in Alice correspond to the programming instructions in more advanced languages such as Java and C++. Final project programmed by Natascha (13): an exploration game set in space where players must free bunnies being held captive by an evil villain.